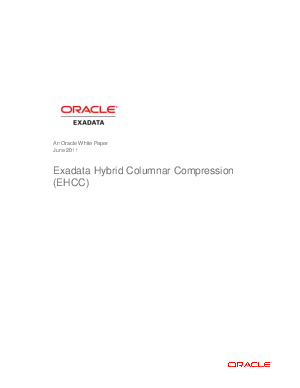 Exadata Hybrid Columnar Compression enables the highest levels of data compression and provides enterprises with tremendous cost-savings and performance improvements due to reduced I/O. Average storage savings can range from 10x to 15x depending on which Exadata Hybrid Columnar Compression feature is implemented; customer benchmarks have resulted in storage savings of up to 204x! With average savings of 10x, over five times the industry average compression savings, IT managers can drastically reduce and often eliminate their need to purchase new storage for several years. For example, a 100 terabyte database achieving 10x storage savings would utilize only 10 terabytes of physical storage. With 90 terabytes of storage now available, IT organizations can delay storage purchases for a significant amount of time. The 90 terabytes of storage could even be used to store up to 9 more databases with 100 terabytes of data compressed to 10 terabytes of actual disk space each.